Scripture memory is one of my favorite things to talk about. 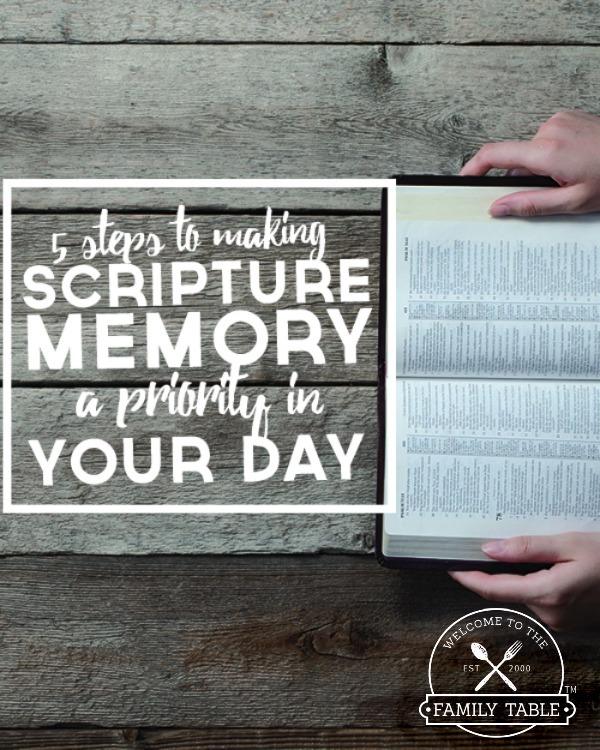 I am excited to talk to you today about different ways to make Scripture memory a priority in your day. Most Christian wives and mothers want to spend more time in God’s Word but often find themselves busy keeping their home and raising their children. How can we be sure to make memorizing God’s Word an important part of our day? How can we make Scripture memory a priority without neglecting our God-given blessings? Today we are going to explore this very topic. Over the last 19 years of walking closely with my Savior, I’ve come up with some great ways to make memorizing Scripture a priority in my day without being overwhelmed. 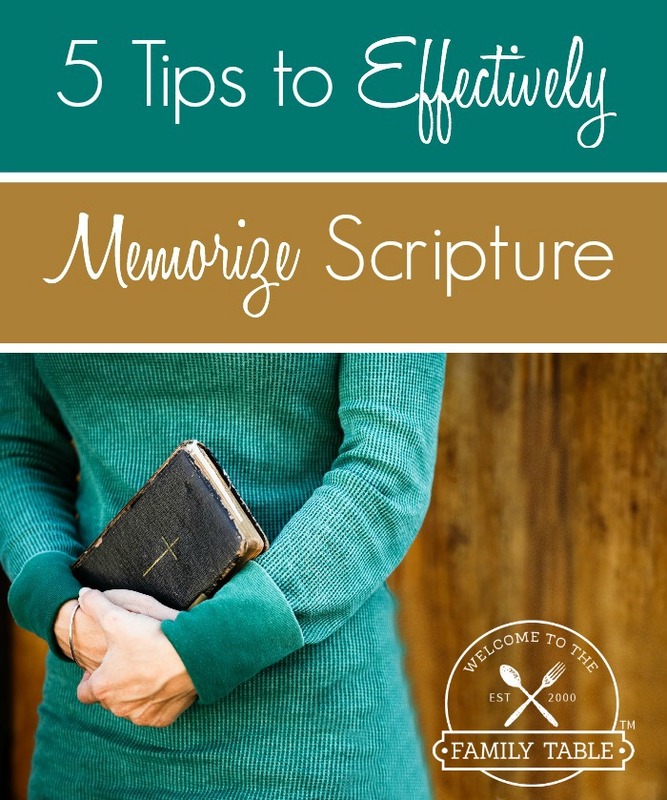 Today I am sharing 5 steps to making Scripture memory a priority in your day. First let me clarify that when I talk about Scripture memory, I am not talking about the robotic memorization of facts. No, quite the contrary. I am talking about hiding God’s Word in your heart in obedience to His Word. I am talking about spending time with your Savior and soaking in His very essence so you can love and serve others well. Have you found yourself wishing the time away? Have you ever wished you could “fast forward” changing diapers and being knee deep in housework all while caring for your busy and curious toddlers? I have one word for you: Don’t! Don’t wish away the gift of time that God has given you in your current season of life. Take it from a mom whose youngest child is about to turn 9 – you will wish that you could go back to those days (what ever they may be) and hold onto them and savor them…but you can’t. Learning to embrace the season of life you are in is a key component to memorizing scripture. As a homeschooling mom of 13+ years, one thing I know for sure: Learning styles are one of the most important things to identify when both teaching and learning. Once you identify you learning style then you’ll be able to focus on hiding God’s Word in your heart through the channel that will most likely make it stick for you. Visual: Print out key Bible verses and place them all over the house. I print out these 3×5 memory verse cards and carry them in my purse and have them in the glove compartment of my van. I use these 30-Day Scripture Journals to write down my thoughts in. There are also some great Bible apps out there you can use to read your memory verses each day. Auditory: Find a talking Bible App so you can listen to the verses you want to memorize each week. Sing your memory verses aloud and/or find worship songs with your memory verse in them. Kinesthetic: Write your memory verses down in your journal or on 3×5 cards. Create a Bible-art journal where you create using your favorite medium of art and write the verse on your finished creation. Once you find your learning style(s) brainstorm with your spouse or close friend on creative ways to hide God’s Word in your heart! Jenny is raising three children ages 4 and under while working from home. She is also in the choir at church and head of the field trip committee at her local preschool. Jenny’s husband works very long hours so she is home with the children mostly alone during the week. She is in dire need of memorizing God’s Word and comprises two different sets of goals to accomplish her desire to memorize more of God’s Word. Read the Bible for an hour every day and memorize 5 verses. Try and get to a quiet place without disturbance. Read 1 verse for 7 days. Print out verse and place in areas I am in often during the day. Clearly the second set of goals is more realistic for the season of life that Jenny is in. Sometimes we try to do too much and set unrealistic goals without even knowing it. And as you know, this sets us up for failure. Every so often when life begins to change (ie: birth of a new baby, job changes, moves, deployments, etc) I will sit down and reevaluate my goals. In doing so I will write down what it is that I want to accomplish both short term and long term. Next I will look at my weekly schedule of homeschooling, homemaking duties, sleep, and exercise. After all of those things are scheduled, I will go back in and insert time for me to read the Bible and pray. PLEASE don’t think that by doing this you are putting God last. This simply isn’t true. We walk with God all day long and put Him first by being stewards of our homes and relationships. And I know I pray and talk to God all day long. Don’t get caught in the legalistic mind-set that if you don’t rise before the family and spend hours with God you are not doing it right. That is a dangerous mindset that leads many women to burnout. If that works for you, fine. But if not, don’t beat yourself up! When I do my planning it is always with flexibility in mind. So if for some reason I don’t accomplish everything on my to-do list I then just shift it to the next day or eliminate it entirely. One simple way to make sure that you are accomplishing most of the to-do list is by prioritizing everything. Don’t be afraid to say no to things that simply are not in line with your priorities. As a matter of fact saying no to outside things is vital to the ability to making Scripture memory a priority in your day. This has been a key to success in my Scripture memory journey! Why? Because by working Scripture memory into my day with those I am with the most ensures that no matter what I will have the opportunity to hide God’s Word in my heart. 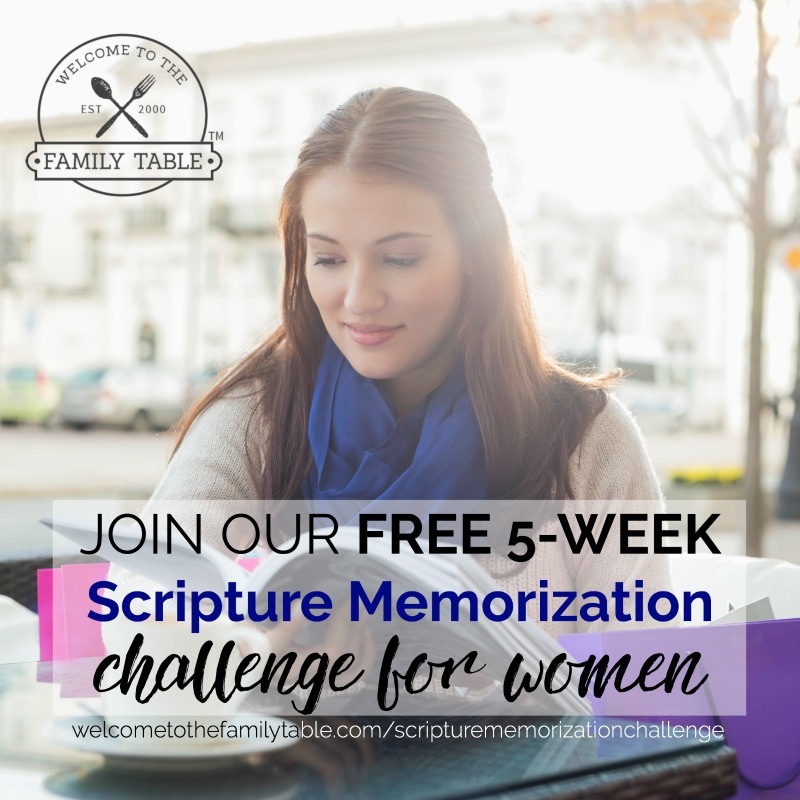 This is an organic way to make memorizing the Scripture a priority in your day as an entire family – and it is so much fun! Watching God work in my own life and the lives of those around me has been one of the most amazing things I have experienced in my 40+ years on this earth. If it weren’t for God convicting me to memorize His Word more than 20 years ago, I would not be the wife, mother, and woman I am today. I am so thankful for the gift of God’s Word and the ability to hide it in my heart. Under goal #2 you wrote, “PLEASE don’t think that by doing this you are putting God last. ” I needed to hear this! Thank you! You are so very welcome. ((HUGS)) We are praying for you today!